Vampire Vapes Heisenberg is a secret recipe that can only be desrcribed as the daddy of all day vapes. A fruity undertone and a cool crystal after-sensation that will leave you wondering what it is and wanting more. 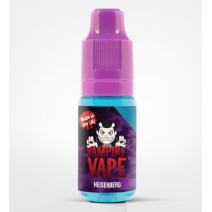 Vampire Vapes Bat Juice is a secret recipe that is full of f..
Vampire Vapes Attraction is a mixture of red berries and fru..
Vampire Vapes Black Ice is a black jack and menthol mix with..
Vampire Vapes Dawn is a mixture of the darkest fruits of the..
Vampire Vape Blackcurrant is a very juicy sweet blackcurrant..
Vampire Vapes Cherry Tree is a sweet and juicy wild cherry f..
Vampire Vapes Cool Red Lips is a sweet cherry mixed with coo..
Vampire Vapes Ice-Menthol is a minty, cool and refreshing va..
Vampire Vapes Pear Drops is sweet and tasty vape with a punc..
Vampire Vapes Pinkman is a mouth-watering fruit explosion th..
Vampire Vapes Rhubarb And Custard is a nostalgic taste of&nb..
Vampire Vapes Strawberry And Kiwi is an aromatic, perfe..
Vampire Vapes Sweet Tobacco is a classic light, vintage..
Vampire Vapes Tropical Island is a refreshing burst of the j..
Vampire Vapes Vamp Toes is a twist on the mixed berry j..